These are highly individual cymbals whose tonal colour and raw complexity could add an esoteric touch to many genres. Though not as keenly priced as other Dream ranges, they are still good value. Great, raw look. Individual sounds. 14" hi-hats are great. Looks will divide opinion. The 22" Moon Ride lacks nuance. Dream cymbals are made in a family-owned factory that has generations of gong-making experience in the Wuhan region of China. Unlike many contemporary Chinese mass-manufacturers, Dream hand-makes all of its cymbals pretty much from start to finish. Dark Matter cymbals represent the company's most creative offerings yet. "Dark Matter cymbals are rapidly cooled by being plunged into cold water, where all of the ash, soot and impurities from the firing are locked into the metal"
The first experimental Dark Matter prototypes appeared in 2009 and the range has been evolving slowly since. Dark Matter cymbals actually start out as Energy Series models and so are individually cast from B20 bronze before being hammered and lathed by hand. They then undergo a secondary firing (reheating) before being rapidly cooled by being plunged into cold water, where all of the ash, soot and other impurities from the firing are locked into the metal. At this stage in the R&D process, Dream found it was 'unpleasantly surprised' by the cymbals' performance. After being left to rest for six months the cymbals were then tested again and to Dream's delight they had matured into something far more palatable. This lengthy manufacturing process has since gone into production and currently Dark Matter cymbals are available as hi-hats, crashes and three types of ride. The finish can only be described as raw and a proliferation of hammer marks covers each cymbal, through which smears and splashes of colour - from muddy brown to rust red - emerge. 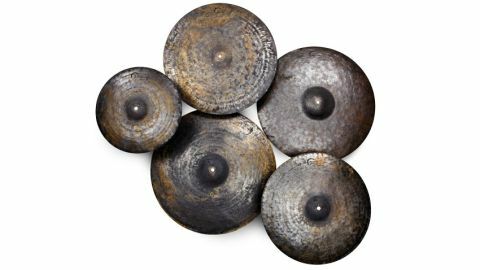 The 14" hi-hats partner a heavy unlathed bottom with a medium-heavy top, with both cymbals sporting prominently raised bells. Played with stick tips the hats give a crisp, slightly dry response with a metallic edge. "The weight of the hats means that they cut through with considerable oomph, leaving a heady mix of attack and darker body." At these dynamics the hats are very articulate, enunciating each stroke cleanly whilst still sounding full. Bringing the edge of the stick into play finds the hats fattening up further, delivering a broad note with controlled overtones. The weight of the hats means that they cut through with considerable oomph - it's as though the mid frequencies have been scooped out, leaving a heady mix of attack and darker body. Opening the hats up and upping the dynamics finds them accelerating to a wash, but holding a rolling boil rather than dissolving into fizziness. We really liked these hats - there's more than a hint of grit in their note to dig into and they have huge amounts of character and playability. The only crash supplied of the two available was the larger 18" model. Like the hats, it possesses a similar blend of high and low frequencies, opening brightly before mushrooming into something darker and dirtier. The sound remains intense, thanks to the large dose of trashiness present, before shimmering into decay. First up of the three rides is the 20" Flat Earth ride. While not being a true flat ride - it has a tiny cup of a bell while the bow has the slightest of tapers - it's pretty close. Being light, it comes to life immediately with a breathy 'ting' while a deeper pitched wash burbles along beneath. The stick sound remains precise no matter how fast the ride is played; crashing it, meanwhile, provokes a gong-like eruption. "Playing the 22" Moon Ride is like taking a stick to a sheet of armour plating"
The 22" Energy ride has echoes of the Flat Earth ride's dryness in its response, though the wash is more pronounced and further embellished with overtones. In keeping with its energy theme the ride almost sizzles when played into, though the dark undertow of the wash brings added body and colour. The bell is clear and distinct, rising brightly over the corresponding falling-off of wash. In complete contrast to the first two rides, the 22" Moon Ride is an off-the-dial slab of unlathed bronze that weighs over 4kgs. Something along the lines of an extra-terrestrial cousin of Chris Adler's Meinl Pure Metal ride, playing it is like taking a stick to a sheet of armour plating. There is no sensation of the cymbal flexing, just a shock wave travelling back up to your hand. Few nuances are present to be teased out of such a ride; it simply delivers an ear-jarring, straight-through-the-mix metallic clang. A degree of wash is generated, but it's so high pitched that it's hard to discern from the tinnitus that will inevitably result from playing it.